Among the many things we love about the summer in Nelson are the youth groups who join us for dances. We all know about the Apple Hill Chamber Music program, which brings youth from around the world to Nelson. Another wonderful group that joins us is Kroka Expeditions, which provides outdoor education through challenging trips. 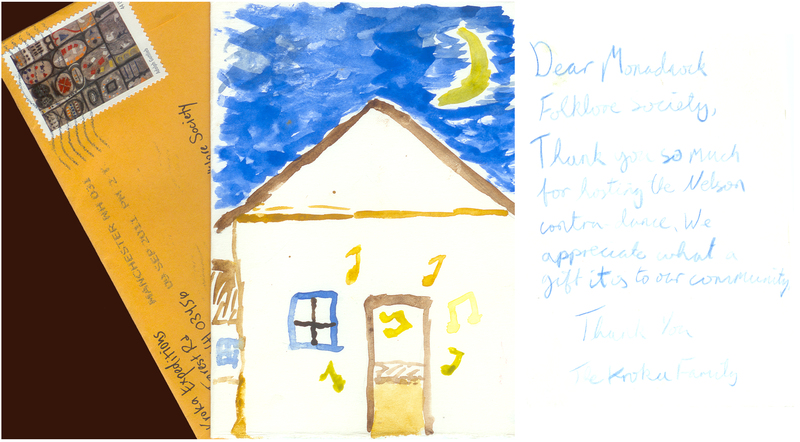 This summer’s Kroka youth sent a lovely card to the Monadnock Folklore Society, reproduced below. Thank YOU, Kroka! Requested donation is $10 per person, $6 for seniors and students. Animaterra also requests attendees bring a nonperishable food item that will be donated to local food banks. A portion of the proceeds will be donated to the Turning Point Theater, Peterborough, NH. This wonderful organization encompasses performers of all abilities and celebrates the unique creativity of every individual. Animaterra Women’s Chorus was formed by women to communicate through the music of the world’s traditions. It welcomes all women in a community of song, reaching out to all people locally, regionally, and globally. It offers an environment of learning and shared musical artistry in which women, whether beginners or experienced, can express themselves through music. 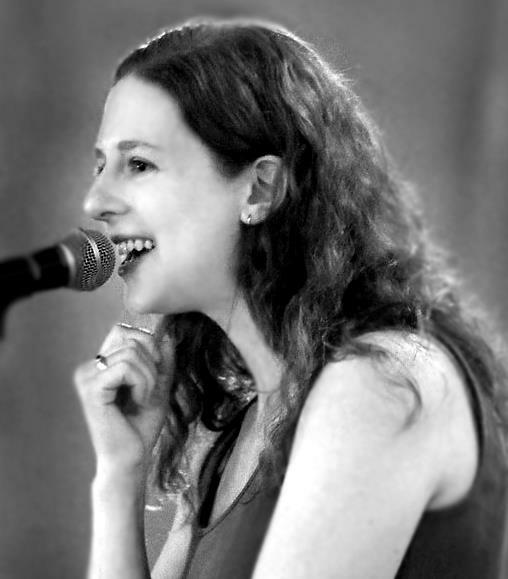 The Monadnock Folklore Society presents the Nelson Second Saturday Contra Dance on April 14th, featuring Marguerite Durant calling with Brendan Carey Block and Eric McDonald. Marguerite Durant is a dance caller and music educator living in Brattleboro, VT. A native of West Newbury, Massachusetts, Marguerite remembers Dudley Laufman leading dances at her elementary school, but it wasn’t until a many years later at a summer graduate course near Glen Echo that she rediscovered contra dancing. She teaches elementary general music in the Greenfield MA Public Schools. Constantly in pursuit of the boundaries of the violin, twenty-seven year-old Brendan Carey Block (the 2000 – 2001 US National Junior Scottish Fiddle Champion) has been performing since the age of ten. His love for the traditional fiddle music of Cape Breton Island, Nova Scotia, has had a big part in crafting his current innovative and energetic sound which incorporates Jazz and Rock elements. Dancing begins at 8:00 PM, with a short workshop beforehand. Beginners and singles are welcome and all dances are taught throughout the evening. Admission is $8 or $6 for students and seniors. The dance takes place in the historic Town Hall in Nelson, NH. For more information call 603.762.0235 or visit www.monadnockfolk.org. 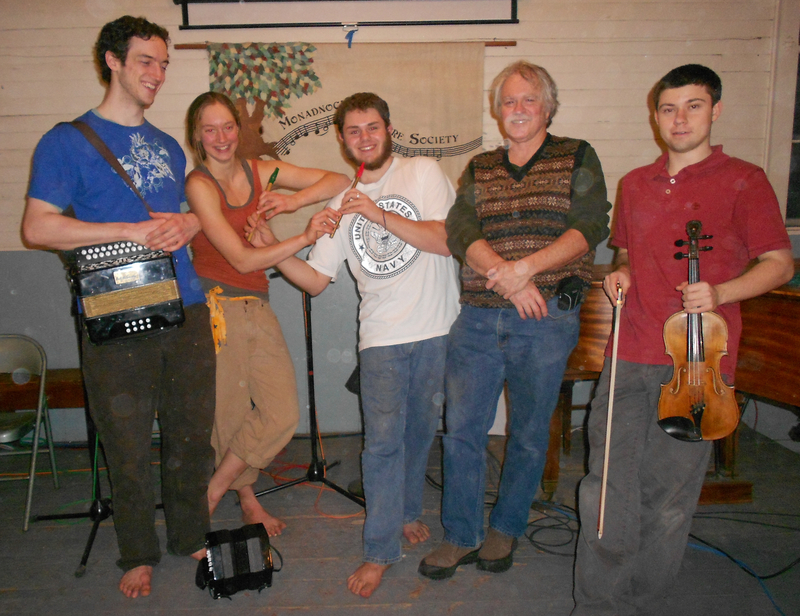 The Monadnock Folklore Society has presented contra dances and concerts of traditional music since 1982. Dancing begins at 8:00 PM. Beginners and singles are welcome — there is a short orientation before the dance for early arrivals — and all dances are taught throughout the evening. Admission is $8, $6 for senior citizens and students. For more information call 603.762.0235 or visit http://www.monadnockfolk.org. 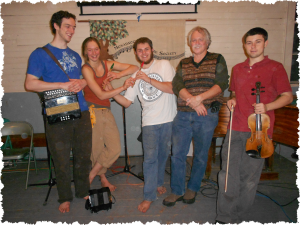 The Monadnock Folklore Society has presented contradances and concerts of traditional music since 1982. 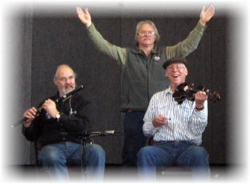 The Monadnock Folklore Society presents the Nelson Second Saturday Contra Dance on March 10th, featuring Luke Donforth calling with Celticladda (Randy Miller, Bill Thomas, Gordon Peery). Adina Gordon finds an outlet for her loves of travel, music, dance and silliness by calling and dancing throughout the US and Canada, creating joy and minor chaos wherever she goes. Combining a voice that makes you want to do what she says with a commitment to using that power for good and not evil, Adina calls contras and squares both old and new that cause spontaneous eruptions of joy on dance floors. She counts it as a job well done whenever anyone says, “I don’t really like squares, but I like your squares.”Based in Brattleboro, VT, Adina has called dances in 36 American states spanning all six time zones, as well as 3 Canadian provinces and Israel. Dancers frequently remark on her energy and joy, which is both highly evident and highly contagious. An often-repeated comment is, “You look like you’re having too much fun.” Too much fun?? What does that even mean? If you’re laughing and smiling, you’re doing it right. That’s all it takes.Adina’s goal is to get you dancing and get out of the way. She says more, with fewer words, to maximize dancing and minimize talking. Trip to Nelson is a lively band with a full orchestral sound. They play with flair and flourish while still having a great traditional sound. The Monadnock Folklore Society presents the Nelson Second Saturday Contra Dance on January 14th, featuring Lisa Sieverts calling with Roger Treat and Gordon Peery. The dynamic female trio that began as a happy accident around a campsite (at the 2004 Falcon Ridge Folk Festival) is now drawing invitations from renowned historic national events like Merlefest, and is winning over audiences around the country. Spurred onward by an ever-growing and devoted fanbase, and the desire to commit themselves to touring farther from home, Red Molly is at the start of a new and exciting musical chapter. After six years of touring, the band announced that guitarist/bassist Carolann Solebello will leave the group in August 2010 to spend more time with family and pursue solo opportunities. Remaining founding members Laurie MacAllister (bass, banjo) and Abbie Gardner (Dobro, guitar) welcome the newest “Molly”, Austin-based singer/songwriter Molly Venter, to fill out their lush, distinctive three-part harmonies. Over the last month of rehearsals and impromptu live performances in Hamilton Park, near their rehearsal space in Jersey City, the three women quickly nailed the essence of the Red Molly sound, while hinting at inspiring new musical possibilities in the months of touring that lie ahead. “We are busily reinventing fan favorites from our current recordings, while adding new material and collaborating on songwriting for the first time,” says Gardner. “This is an exciting time for the band; we’re so thrilled that Molly has joined us,” adds MacAllister. The Boston-area folk music scene is a vibrant one, boasting a variety of diverse artists. But if pressed to name the region’s defining musician, it would have to be singer-songwriter Catie Curtis, who has called it home for nearly all of her twenty-year music career. Since the release of her last album in 2009, Curtis has toured extensively, playing a number of diverse venues ranging from Chicago’s legendary Old Town School of Folk Music to the White House. She’s also spent that time writing and testing out new material, developing a collection of masterfully written lyrics that serve as the heart of her newest record, Stretch Limousine on Fire (out August 30).